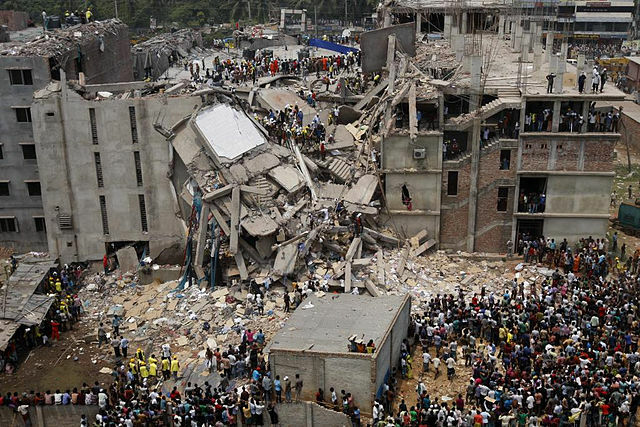 In one chapter dealing with the Rana Plaza Collapse, the author had included a picture of the collapsed building that had been published on Flickr under a Creative Commons (CC) Attribution (BY) ShareAlike (SA) 2.0 license and is also featured in the Wikipedia article on the incident. This statement is breathtakingly flawed on many levels. 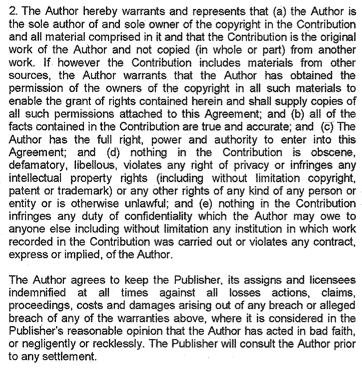 The publisher does not need to “copyright the material”. What it needs is the permission to reprint the work in a commercial setting. In the case at hand, the Creative Commons license explicitly grants commercial use. Already the license deed states that anyone is free to share and adapt the work “for any purpose, even commercially”. does not require the Collective Work apart from the Work itself to be made subject to the terms of this License. Since the comment by the publisher is presented as standard procedure, one can only imagine how many authors are regularly misled about the legal implications of Creative Commons licenses. I find this particularly problematic when – as in our case – such wrongful legal claims are provided by a large and reputable publishing house and its legal department. In my chapter on Wikipedia in the same volume, a screenshot of Wikipedia’s predecessor Nupedia licensed under CC-BY-SA was also rejected because the publisher claimed that it didn’t have the permission to reprint it (in this case even without giving an explanation). Independent of how this plays out in this particular case – for now, we plan to insist on including the respective figures in the volume – the overall point remains: the overly restrictive application of copyright law by powerful publishers is a signature example for permission culture and makes an already deficient copyright regime even worse. At the same time, this practice shows how important it is to strengthen exceptions and limitations to copyright with regard to quotations, research and edcuation. And it is one of the main reasons why I prefer to publish in open access outlets, which embrace instead of misread Creative Commons licenses. This is a very important point to make, thanks for illustrating it with examples. I also experienced such issues, we still need a lot of education. I think your interpretation of the CC BY-SA v2.0 licence is wrong. The licence defines a “collective work” as a work “such as a periodical issue, anthology or encyclopedia”. In other words a collection of works each of which stands in its own right. The problem with using a photograph inside another work is that the new work is not independent of the photograph. The result of including tables or illustrations is nothing like an “anthology” or other examples given in the definition. If the drafters of the licence had meant to extend “collective work” to quotation then they should have said so. I don’t want to argue over this point too much because the most recent version of CC (http://creativecommons.org/licenses/by-sa/4.0/legalcode) is drafted on a different model. There is no definition of “collective work”. Here everything depends on what is meant by “Adapted Material”, rather than whether something is excluded by an additional category of material. Most copyright lawyers would understand an article in which a table or a photograph was quoted as being “derived from” the photograph. My guess is that you consider that the photograph would not have been “translated, altered, arranged …” and hence that the article + photograph is not “Adapted Material” is that right? If so, it would be a very odd way to put together a licence. In particular it would mean that a very small change to the photograph (eg cropping, changing its size, presenting it using different colours) would constitute an adaptation, whereas an identical copy unaltered would not. I can’t help but think that is not what the CC drafters were after – but I may be wrong about that. My guess is that publishers who want to “own” their authors’ contributions are avoiding SA licences because they have been advised by cautious lawyers that the effect of the licence may require them to licence under CC etc. NB: I am a supporter of open access and think that publicly paid for research ought to be public domain, but that doesn’t mean that CC works that way. a) What the CCPL BY-SA 2.0 Generic defines as quoted in the article is what is _not_ meant to trigger the ShareAlike clause. That becomes clear by the following sentence “A work that constitutes a Collective Work will not be considered a Derivative Work (as defined below) for the purposes of this License.” Ergo, as long as we have a collective work in the defined sense, the publisher doesn’t need to fear any impeding contagious effect on other parts of the publication. b) No, “derived” in the copyright sense is usually strictly distinct from quotation. What’s more, a person quoting is not even allowed to make any changes of meaning/message to the (part of the) work quoted. So the relation is one of reference to the quote, not one of deriving from it. The quoting work might become hard to understand without the quoted part or might even become entirely unfounded content-wise, but it is surely no derivative. c) All so-called copyleft licenses put special conditions on those uses that have the licensed work altered (cropping, remixing …) as opposed to unaltered use (reproduction in full). The simple reason is that only alterations can produce a new layer of rights ownership, meaning rights of the person making the derivative. This layer is to be disarmed by the copyleft clause (which in the case of CC licenses is called ShareAlike). There doesn’t seem to be anything odd about this. « What’s wrong with “Portfolios of the Poor”?